When you think about a B and B in Jefferson Texas you probably don’t even think about the other creatures that might also like to spend some time there, do you. Well I can tell you that there are many that love our flowers and ferns too. Five little baby House Finches in their nest. I first notice a bird sleeping in the eve of the front porch a few weeks ago. I thought it was an odd place to see a bird at night, and then I noticed two of them kept landing on our porch swing chain. 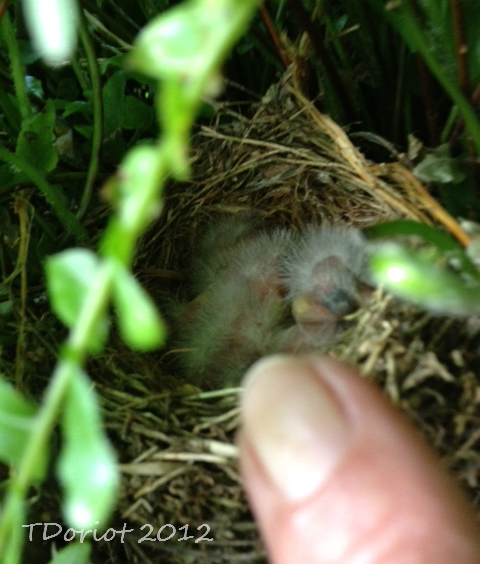 I was telling David about them and he pops out with, “Oh I just noticed a nest in the fern hanging by the swing”. So now I know why they are there. Well I just had to see the nest so I got out the step ladder and was completely surprised by this perfect little nest and the five beautiful tiny blue eggs inside. I can tell you this really made me happy to give them a home. The pair of House Finches on our porch. Nest with the eggs, my index finger to show the size perspective. 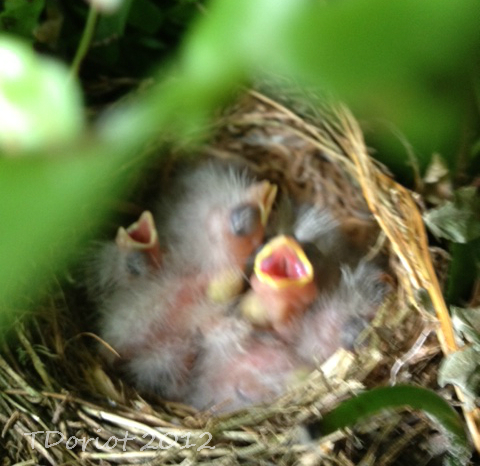 And a third baby birds awakens. The babies and my finger showing the size. 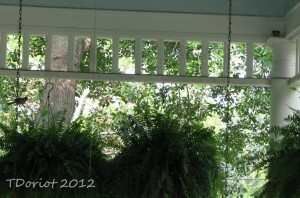 Now I can sit on the other end of the porch and just quietly watch the pair come and go all day long if I want to. I have been trying to get pictures of the birds to share. But they are so small and colored such that as soon as they land in the trees they just disappear. Then it happened and I was able to get a good picture of both of them early in the morning. 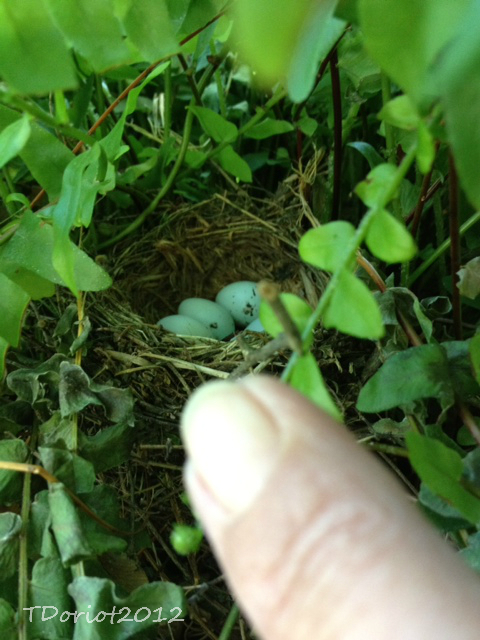 This afternoon while I was writing this post I thought about how long it had been since I first saw the nest and I wondered if the eggs had hatched yet. 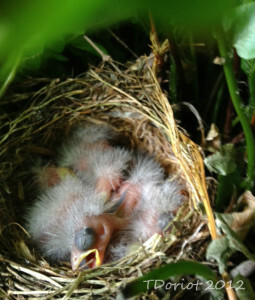 So I got out the step ladder again and much to my delight I found baby birds in the nest. They were sleeping when I first looked then they opened their little mouths to eat, once they realized I didn’t have any food they went back to sleeping peacefully. 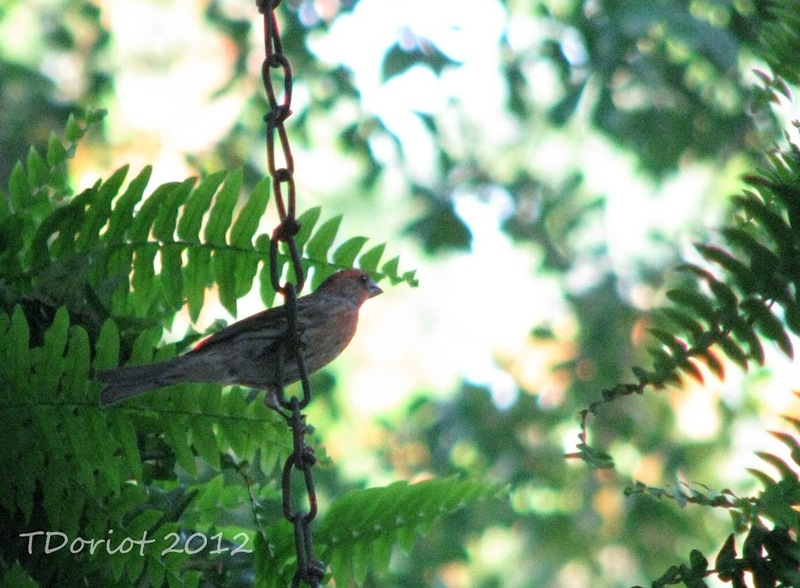 Now I know they are House Finches and they may stay and have more babies this year. I am very excited because I just love to bird watch, the cardinals flitting about, the vultures landing in the trees drying their wings and now wrens to watch grow. I ask you who could ask for more than that. Note: Originally I thought the nest was from a pair of Carolina Wrens. I posted some pictures on our Facebook Page of the birds I was able to get on May 7, 2012 and a very nice local man gave me a link that shows they are actually House Finches. We had been hearing a lot of birds singing at night and wondered what the birds were; well low and behold it is from these House Finches. Here are some recording of their songs. 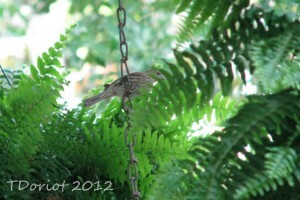 This entry was posted in Bird Watching by Tammy D. Bookmark the permalink. 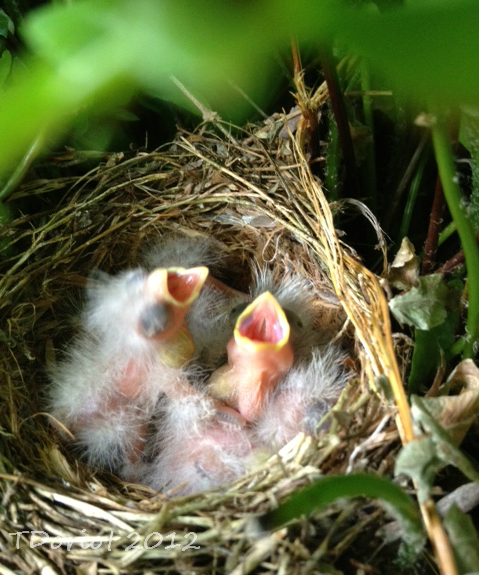 How cute and what fun to have guests of a feathery nature!